Due to the electronics involved in the ATS, the ATS is susceptible to the surge environment that is common at the service entrance location where the ATS is installed. Surges from the utility feed due to lightning, load switching, etc. can be detrimental to the operation of or can destroy the ATS rendering the system useless. Also, when the generator starts up, the voltage may not yet be stabilized at the instant the ATS makes the transfer. This initial surge of not yet regulated power can damage electronic systems. One technology available that aid in correcting these issues is surge protective devices (SPDs). This application note focuses on applying SPDs to an ATS system to mitigate the damage that can occur due to the expected surge environment. To aid in the description of the application of SPDs to an ATS system, please refer to Figure 1. This figure illustrates a typical ATS layout. The incoming power system configuration can vary greatly. As noted, there are a number of opportunities for protecting the typical ATS system – each are labeled with a circled number and are described below. prevents surge damage due to events propagated on the electrical system from upstream sources such as lightning and switching surges created by the utility. Electronic circuitry is often included on the utility side of an ATS. These circuits require protection to ensure proper operation of the ATS. At this location, a parallel connected,Frequency Responsive Circuitry™ device is appropriate (includes Voltage Responsive Circuitry™ as well). Frequency Responsive Circuitry™ is recommended for this location due to the presence of switching transients that can be generated due to load switching and distant lightning events on the utility feed. distance between the generator and the ATS is greater than 30 feet or has external wiring. In these cases, the ATS is exposed to direct lightning strikes to the wiring between the ATS and generator or is exposed to near-by strikes to the ground or structures near the wiring. Again, due to the electronic nature of most ATS systems, a parallel connected, Frequency Responsive Circuitry™ device is appropriate (includes Voltage Responsive Circuitry™ as well). Frequency Responsive Circuitry™ is recommended for this location due to the presence of switching transients or ringing transients that are often propagate between the generator and the ATS. therefore, exposed to direct lightning strikes to the wiring between the ATS and loads or is exposed to near-by strikes to the ground or structures near the wiring. Due to the electronic nature of most ATS systems, a parallel connected, Frequency Responsive Circuitry™ device is appropriate (includesVoltage Responsive Circuitry™ as well). Frequency Responsive Circuitry™ is recommended for this location due to the presence of switching transients or ringing transients that are often propagate between the ATS and the loads connected to the output of the ATS. circuit is used to initiate generator startup when the utility power is absent as well as shut down after utility power returns. This circuit is usually 12-24 VDC. Providing protection at this location prevents surge damage to the control circuitry that starts the generator. Without this function, the ATS will not start the generator. If the distance between the ATS and the generator is greater than 30 feet or has external wiring, an SPD is recommended also at location 6 to prevent surge voltages from accessing the ATS electronics. At this location, a series connected, Frequency Responsive Circuitry™ device is appropriate (includes Voltage Responsive Circuitry™ as well). 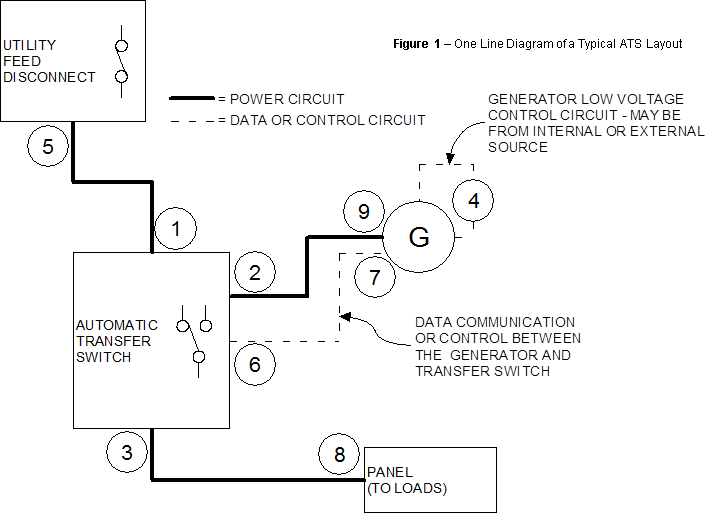 These circuits are often low-voltage DC circuits and could be fed by another source. system. Providing protection at this location creates a layered protection approach. With this approach the SPD on the utility feed disconnect mitigates the largest portion of incoming surges and limits the exposure of the SPD protecting the ATS utility input. The result of this action is that let-through voltage that the ATS is exposed to reduced which lessens the chance of failure or disruption of the ATS system. The need for protection at this location is emphasized if the distance between the utility feed disconnect and ATS is greater than 30 feet or has external wiring. At this location, a parallel connected, Voltage Responsive Circuitry™ device is appropriate. By having a Frequency Responsive Circuitry™ device at the utility feed input on the ATS, Frequency Responsive Circuitry™ is not necessary at this location. allow feedback from the ATS to the generator and vice-versa. These circuits can also be used to provide operational status information to operation centers often found in larger facilities. Protection at these locations is critical when this function is present in the system. This is further emphasized if the distance between the ATS and generator is greater than 30 feet or has external wiring. Often a remote annunciator panel will be used at a distant location that can replicate the data shown on the annunciator panel on the generator. This can require anywhere from four to eight 12-24 VDC circuits.In these cases, these lines are exposed to direct and near-by lightning events. 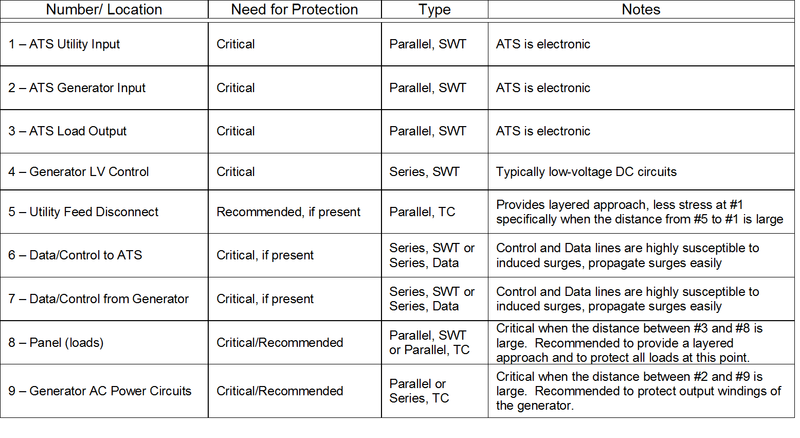 Selecting an SPD for these locations will depend upon the type of circuit used for communication or control. If these are powered circuits, a series connected, Frequency Responsive Circuitry™ device is recommended. If these are data or communication circuits, then a data-line device is recommended. Typically, data communications for this type of circuit would be relatively low speed (< 2 Mbps). provides a layered approach for the loads being protected. Although, this location is outside the scope of the ATS system, it is not any less important. Protection at this location is even more critical when the distance between the ATS and the loads is greater than 30 feet or has external wiring. In these cases, these lines are exposed to direct and near by lightning events. Selecting an SPD for this location depends on the types of loads being protected. If the loads are electronic in nature, it is recommended to use a parallel connected, Frequency Responsive Circuitry™ device. If the loads are less critical or less susceptible to surges, then a parallel connected, Voltage Responsive Circuitry™ device might be considered. distance between the ATS and generator is greater than 30 feet or has external wiring. The goal of providing protection at this location is to protect the output windings of the generator. In addition, an electrical circuit may run from a separate building power source (Anormally from an emergency power panel) to the generator to power a battery charger and sometimes a jacket water heater. It can be single-phase 120, single-phase 120/240, or three-phase 120/240 or 120/208. At this location, a parallel connected, Voltage Responsive Circuitry device is recommended. A series connected device can also be used, depending on the current level.